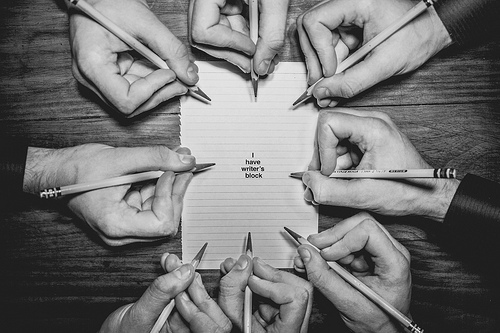 (Photographs by David (static images) and Honda (moving shots). 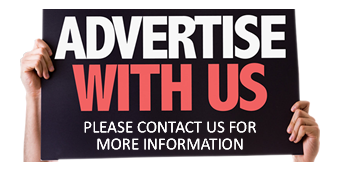 When asking what is the World’s best selling SUV would it be a Land Rover/Range Rover of some type, a Ford, an Audi, BMW or Mercedes or a Kia, or Hyundai, a Mitsubishi, Suzuki or perhaps one of a multitude of American brands other than Ford? 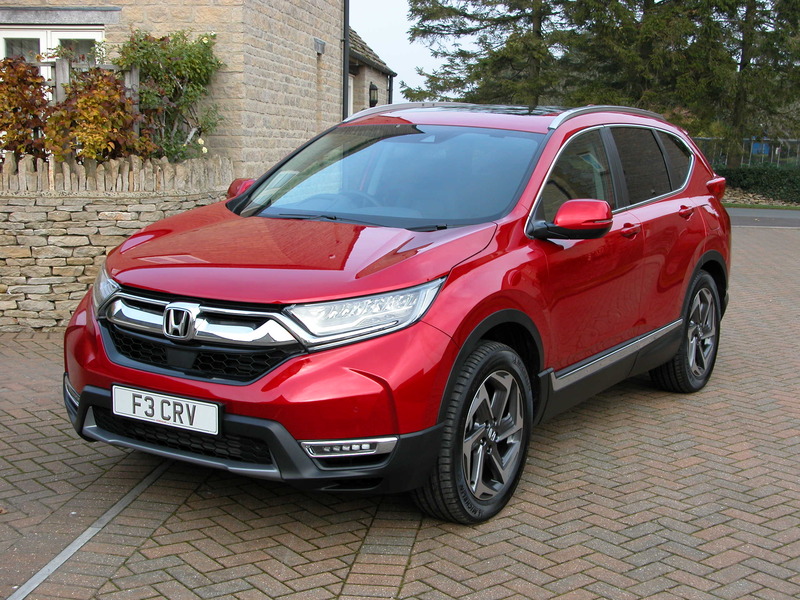 In fact it’s Honda’s CR-V, and since the first generation model went on sale in 1995 it’s gone on to become the World’s favourite in its highly competitive, high selling sector. So far in its lifetime over 9.0 million CR-Vs have been sold in 150 countries, with around 13,000 sold in the UK annually. 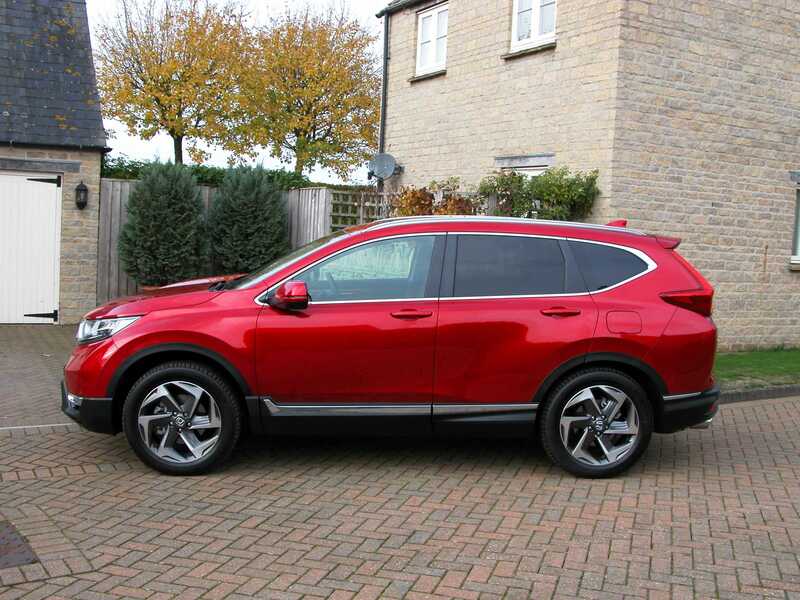 Recently the latest generation CR-V has gone on sale in the UK with five and for the first time seven seat versions, but this time no diesel engine option. Currently there is only their 1.5T VTEC four cylinder turbo petrol engine but it’s available with 173 hp and 220 Nm (162 lb.ft) of torque for manual gearbox models and 193 hp and 243 Nm (179 lb.ft) of torque for the CVT automatic models. Gone are the 2.0 litre petrol and 1.6 litre diesel options. There is the choice of six-speed manual and new CVT auto gearbox options plus 2WD or 4WD options depending on the specification chosen. Spec levels are S, SE, SR and EX and prices range from £25,995 up to £36,455. A petrol-electric hybrid 184 hp powertrain option will join the line-up in 2019. Despite the fall in demand for diesel powered cars it’s still an interesting decision not to offer diesel power, especially in the SUV market sector. It’s strategically a strange move because Honda does well with its new 1.6 litre 120 hp diesel powered Civic Hatchback and Saloon models, especially popular with high mileage business users. 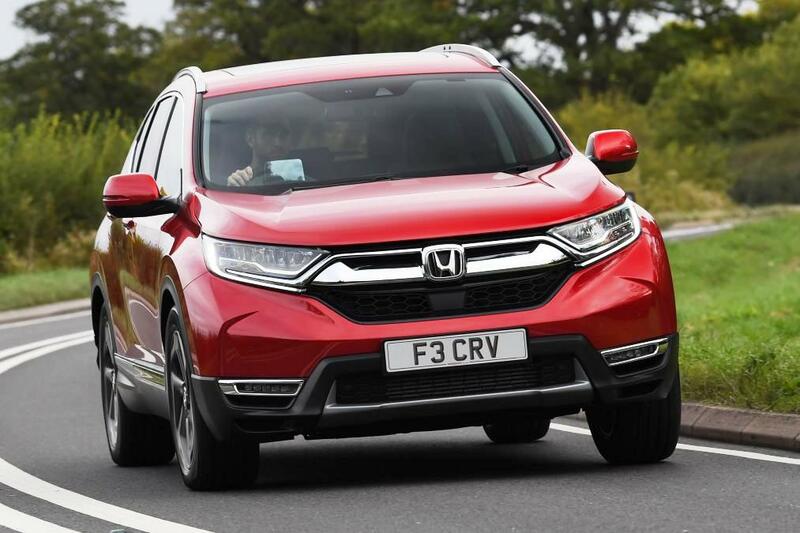 Although built on a new lighter and stronger platform with a 30 mm (1.18 in) longer wheelbase at 2,663 mm (8.74 ft) the exterior design of the five door large and latest CR-V looks an evolution of the outgoing generation. It is 4,600 mm (15.09 ft) long but it’s broader at 1,855 mm (6.09 ft) with muscular wheel arches and sharper contoured styling lines for the clamshell bonnet and the rear quarters. Although an evolution in styling terms, it still looks a more imposing and dynamic vehicle with more kerb appeal than the previous conservatively styled design. At the front is the new Honda family face design with a signature headlight graphic unique to the CR-V. Honda Sensing active safety and driver assistance technologies using radar and camera information are standard across the range. Improvements to the vehicle’s aerodynamics are a major part of the new model’s design. These changes include narrow front pillars, a flush mounted windscreen, recessed wiper arms, a sculptured front bumper and Active Shutter Grille system which keeps the shutters closed most of the time until temperatures require them to be opened in varying degrees. Under engine and floor shield covers also smooth the air flow, aiding the aerodynamics and so reducing fuel consumption and emissions. Underneath the skin of the new CR-V is a new platform, which is lighter with a 25% increase in torsional stiffness and a 35% increase in the body’s rigidity, which not only improves safety but provides sharper handling. A new suspension system is also used with MacPherson struts at the front and most importantly for ride compliancy and stability, a rear multi-link system is used. The dual pinion variable ratio electrically-assisted power steering tuned for European markets improves feedback and, accuracy. Inside, the latest CR-V looks and feels roomier with increases in space in all directions especially the extra 50 mm (1.97 in) of legroom for the second row of seats. The side doors – front and rear – open wider for easier access. My test version was the five seat models with a fixed bench rear three seat system with 60-40 split folding rear seat backs. I gather from colleagues who have seen the new seven-seat models, although the middle row of seats slide forward to help access, the third row comprises of two tiny seats and legroom is very limited. Depending on the five or seven seat versions boot space varies from 561 litres (19.81 cu.ft) up to 1,756 litres (62.01 cu.ft) with the rear seatbacks folded flat. There is also a variable height boot floor and higher specification models have an electronically operated rear tailgate. Braked towing weights vary depending on the model between 1,500 and 2,000 kg (3,307 and 4,409 lb). 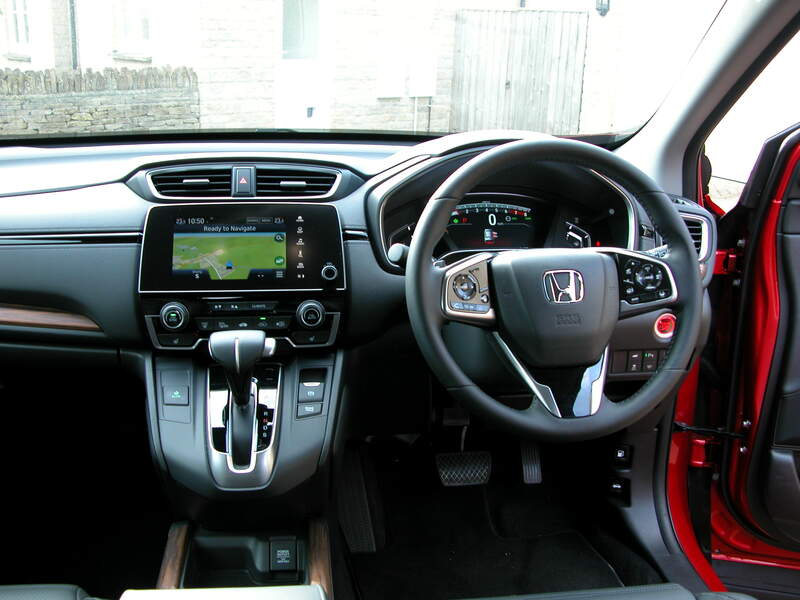 The interior overall has received a general upgrading in terms of textured soft touch trim finishes, in keeping with its move upmarket and price increases. There are still some areas of hard plastic trim, namely the glovebox lid and the door bins. There are ribbons of simulated wood trim, and with shiny plastic and chrome inserts used in the fascia panel, door cards and large central storage area. All versions have an element of digital instrument cluster displays, and all but the entry-level S version has a central seven-inch touchscreen. Some heating, ventilation and radio controls can be operated without using the touchscreen. But air/con and heat distribution is a touchscreen function. Why a simple on/off air-con button is not fitted with dials or buttons for heat/air distribution are not used for simplicity and safety is an on-going issue with several manufacturers. The GARMIN navigation system fitted to all but the base model is simple to use if not the latest in technology. Apple CarPlay and Android Auto connectivity is standard on all versions except the base S level of spec. There are the usual steering wheel controls and various other functions and switches, some easy to fathom, some less so but familiarity helps. My test model was the top of the range EX level and that comes loaded with spec ranging from 19-inch alloy wheels to an opening panoramic sunroof, electrically adjustable driver’s seat with memory function, heated front seats, heated outer rear seats, heated steering wheel, a heads up display and a hands free powered tailgate. Leather upholstery, heated windscreen, LED front fog lights, smart entry and push button start, Blind Spot and Cross Traffic Alert warnings and rear view camera are carried over from lower spec models. Mechanically my new CR-V five-seater test car was the 1.5T VTEC turbo petrol EX with CVT auto transmission and 4WD so it had the higher 193 hp power output and the extra torque of 243 Nm (179 lb.ft) from 1,900 rpm right through a broad powerband up to 5,000 rpm. The downsized petrol engine is responsive enough, more than its capacity suggests, but it’s no strong performer. It does things just about well enough, it’s refined if used reasonably but it does get noisy when the acceleration capabilities are pushed hard. The CVT single forward speed transmission does inhibit progress somewhat but if the steering column mounted gearshift paddles are used these simulate six manual gearchange points, so reducing the perceived power loss and engine noise whilst accelerating. 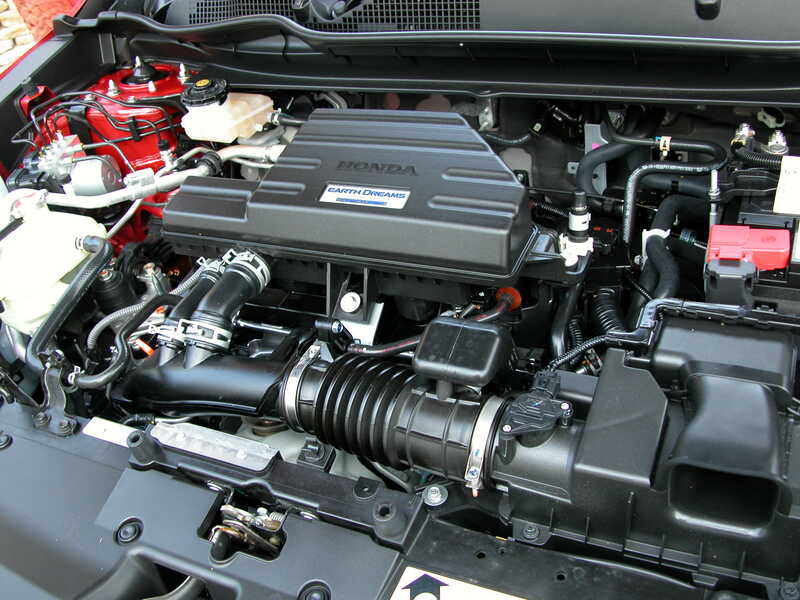 Most users will go with the steady flow of performance and let the CVT auto and engine combination work in harmony. It’s not a fast sports SUV, it’s just an easy to live with one with comfortable riding and smooth handling. Top speed is 124 mph for the 193 hp auto, 130 mph for the 173 hp manual, zero to 62 mph takes 10.0 seconds for the auto and 9.9 seconds for the manual. The Combined Cycle fuel economy for the auto with 4WD is 39.8 mpg and 42.8 mpg for the manual. The CO2 emissions are 162 g/km for the auto and 151 g/km with the manual, both with 4WD. This means the VED First Year rate is £515 for manual/auto versions and then £140 Standard rate. Company car drivers will pay 33% Benefit-in-Kind tax for the auto with 4WD and 31% for the manual with 4WD. My test drive fuel consumption for a week of motoring with the auto with 4WD covering local winding roads, some in-town travel and 300-miles of motorway and dual carriageway cruising returned 32.5 mpg, somewhat shy of the official 39.8 mpg figure but 36 mpg was recorded on a more leisurely driven journey. Whilst the auto with 4WD is easy to live with, nice to drive if not pushed too hard, it is more expensive at £36,455 by almost £2k to buy than the manual and has higher tax costs for business users so they might choose to wait until the petrol-hybrid models come along next year. 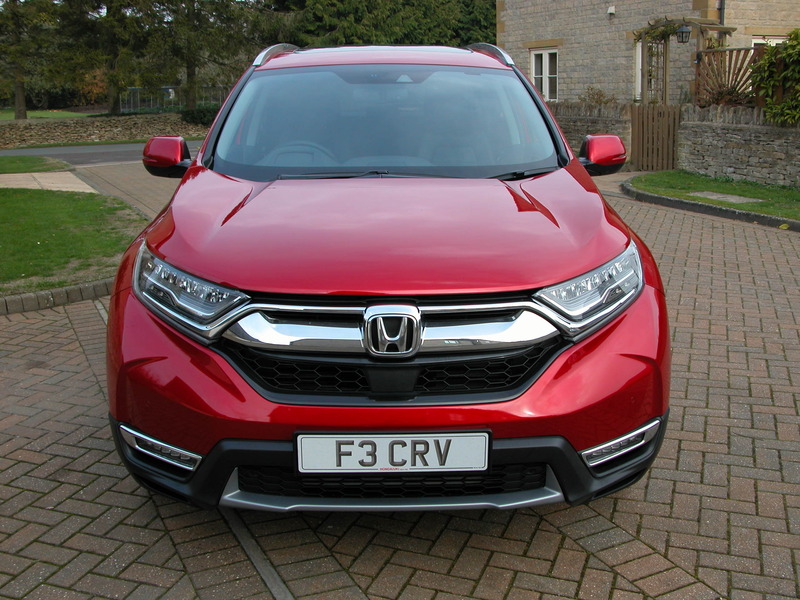 Overall the latest Honda CR-V has improvements in all areas, other than no diesel engine option, but it still has the potential to stay the world’s best selling SUV. For: Bolder exterior design, more interior space including valuable rear seat legroom, improved interior quality and specification, comfortable ride, safe and secure handling, good warranty. Against: Performance and fuel economy drawbacks for the downsized petrol engine with the CVT gearbox and 4WD, top spec models are costly, expensive CVT option, old fashioned sat/nav/infotainment system, no diesel engine option. Honda CR-V 1.5T VTEC EX, 4WD, CVT auto, 5-seater. Engine/transmission: 1.5 litre, four cylinder, turbocharged petrol with 193 hp and 243 Nm (179 lb.ft) of torque from 1,900 rpm, CVT auto with manual mode, 4WD on demand traction. Performance: 124 mph, 0–62 mph 10.0 seconds. Combined Cycle: 39.8 mpg (32.5 mpg on test). 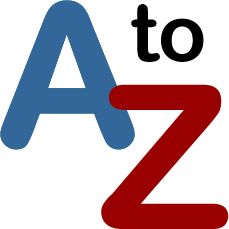 Emissions and taxation: CO2 162 g/km, VED First Year road tax £515 then £140 Standard rate, BiK company car tax 33%. Dimension/capacities: L 4,600 mm (15.09 ft), W 1,855 mm (6.09 ft), H 1,689 mm (5.54 ft), wheelbase 2,663 mm (8.74 ft), boot/load space 561 to 1,756 litres (19.81 to 62.01 cu.ft), braked towing weight 1,500 kg (3,307 lb), five doors/five seats.